to Drumscool - a totally mobile drum school with all of the equipment needed to teach the art of drumming installed in a purpose-built unit that travels between all of the major towns & cities in the South-West of the UK. Drumscool can visit your City, Town or school - all that is required is that a minimum of ten students book a one hour sesson on the same day - why not get in touch with us now to find out more? Drumscool caters for students of all abilities, from beginners to the advanced. Our students are aged from eight upwards - to retirement and beyond, so never feel that you are too old or young to learn to play the drums! We can take our students through all eight of the relevant grades, and can help to prepare a student for a one year's diploma at one of the world's leading drum schools (drumtech). 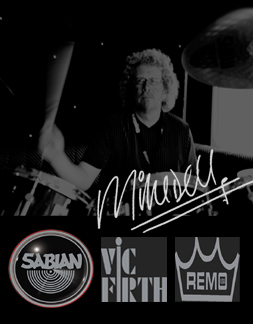 We also cater for the not-so-serious drummer, who simply wants hours of drumming enjoyment! Drumscool teaches all students on a one-to-one basis over a series of one hour session held in separate cubicles. The Drumscool Pro sessions include tuition on bass drum techniques, stick control, sight reading, and playing styles. All Drumscool sessions must be paid for in advance; when you attend the booked session, we request payment for the next session (if required). CONTACT US NOW TO BOOK A SESSION! CALL MIKE DELL ON 07767 364 825 or click here to contact Mike Dell via email.